Eagle in the Snow is widely recognized as a modern classic in the historical fiction genre, creating living characters, set in a factually correct past, that is brought to life through the skill of the writer. I must say, right up front, that this is a book for fans of Ancient Roman history and military warfare. The terrible outcomes of the military struggles described in the book are known by history, so the struggles and efforts of the characters can be a bit depressing (I had to read the book in small doses so as not to become to depressed!). And Mr. Breem was an amateur historian, who wrote his book for another amateur historian, his wife, so much explanatory matter is left out. This can be confusing for those not up on their Classical history, but it is the reason why this book is a "must have" for other amateur historians. Wallace Breem's work has inspired other historical novelists since this, his first novel, came out in 1970. You'll find many elements of his novels and characters in the books by Lindsay Davis (Marcus Didius Falco Mystery Series) and Steven Saylor (Gordianus the Finder Mystery series). 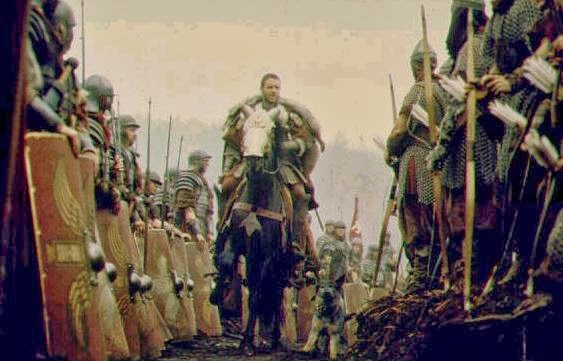 And the Italian novelist Valerio Massimo Manfredi's book The Last Legion, which was made into a film of the same name, takes up the Excalibur plot-line that is suggested by a line near the end of Eagle in the Snow. Mr. Breem had a skill for character, for the cinematic showing-not-telling, and a vast knowledge of Ancient Roman society and military science. Eagle in the Snow was re-released in both hardback and paperback not that long ago, although it is still hard to come by. But it is now available as a Kindle (mobi) e-book. And there are plenty of second-hand copies in circulation. 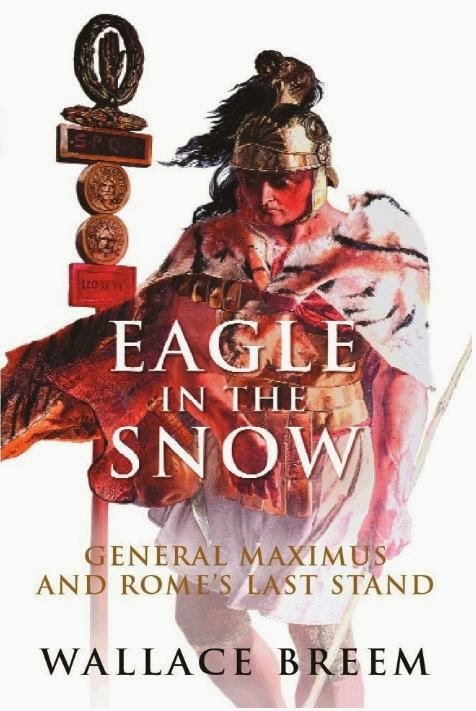 Interest in the book was renewed partly because the character of Maximus, Quintus and others that appeared in the Oscar-winning film Gladiator, were inspired at least in part by the characters in Eagle in the Snow. 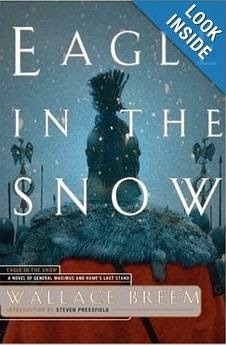 And the opening sequence of the film, on the Eastern border of the Roman Empire, was straight from Eagle in the Snow. General Maximus honored by his legionnaires in the film Gladiator. Wallace Breem's book covers most of the life of Maximus, a fictional Roman General, who recounts his story to some defeated peasants in Cornwall, England, and to us. He recounts how over the course of his career, he has defended the Roman Empire from invasion by hordes from the North, and then from the East under Roman General Stilicho (roughly present day France from present day Germany). Maximus is a perfect Roman soldier: brave, orderly, rigorous, dedicated, honorable and dependable. He is a staid and stolid man whose greatest pride is in his self-discipline, and the forces under him. So he is understandably shamed to see the poor state of Rome's famous legions as the Empire crumbles under the continued attacks from tribes outside the Empire's frontiers (the limes). Maximus puts up a thankless struggle against a unified force of invaders both in the North and in the East. 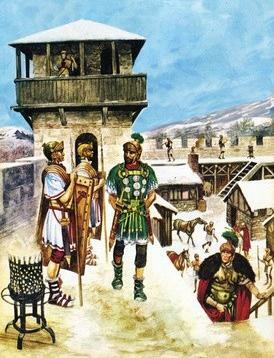 But the winter invasions by barbarian tribes over the frozen Rhine River in 406-407, which he attempts to counter, are often sited as the beginning of the end of the Roman Empire, as Mr. Breem recounts in his book through stolid Maximus's account. The book is full of painfully real characters set in a meticulously imagined past that is painted with a light touch. Maximus's stolid character produces many moments of poignancy. Banished to the Empire’s farthest outpost, veteran warrior Paulinus Maximus defends The Wall of Britannia from the constant onslaught of belligerent barbarian tribes. Bravery, loyalty, experience, and success lead to Maximus’ appointment as "General of the West" by the Roman emperor, the ambition of a lifetime. But with the title comes a caveat: Maximus needs to muster and command a single legion to defend the perilous Rhine frontier. On the opposite side of the Rhine River, tribal nations are uniting; hundreds of thousands mass in preparation for the conquest of Gaul, and from there, a sweep down into Rome itself. Only a wide river and a wily general keep them in check. With discipline, deception, persuasion, and surprise, Maximus holds the line against an increasingly desperate and innumerable foe. Friends, allies, and even enemies urge Maximus to proclaim himself emperor. He refuses, bound by an oath of duty, honor, and sacrifice to Rome, a city he has never seen. But then circumstance intervenes. Now, Maximus will accept the purple robe of emperor, if his scrappy legion can deliver this last crucial victory against insurmountable odds. The very fate of Rome hangs in the balance. Combining the brilliantly realized battle action of Gates of Fire [by Stephen Pressfield] and the masterful characterization of Mary Renault's The Last of the Wine, Eagle in the Snow is nothing less than the novel of the fall of the Roman empire. ...there is a poignant Latin coda at the end of the original text, along the lines of a Roman funerary inscription, that is MISSING from both Rugged Land editions (hardback and paperback) -- how do these things happen? Shame on the publisher. This ties up some lingering questions about how Maximus' narrative came to be and is a fitting sign-off to this powerful story. Maximus said, "They have no tombstones. Not one man in Treverorum wept for their passing." he looked at his audience in turn and smiled. 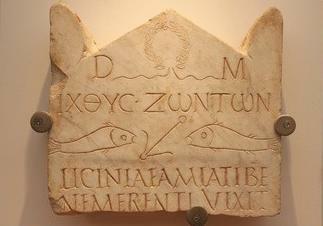 "In the name of Mithras, my master, may the gods be kind to you on your journey." in the Battle of the Rhine. Their friend Saturninus erected this.